Bakery associate Tamon Halfin is accused of real estate fraud. OAKLAND — New criminal charges were filed Thursday against one of three Your Black Muslim Bakery members accused of kidnapping and torturing two women in May.The new charges, which were filed shortly before the bakery members appeared in court, accuse Tamon Halfin of 20 criminal acts related to the illegal purchase of two houses in Oakland. Halfin is also accused of about a dozen felony counts related to the kidnapping and torture of the women in May. Court documents allege that Halfin used a fake name to secure four loans that were used to purchase homes at 7601 Lockwood St. and 9217 Sunnyside St. in Oakland. Using the name Jason Peterson, Halfin secured more than $1 million from BNC Mortgage and Long Beach Mortgage between October 2005 and December 2005, the documents state. Halfin did not enter a plea in the real estate fraud scheme or the kidnapping and torture case. Instead, his court-appointed attorney, Michael Berger, asked for more time to review the case before his client enters a plea. The real estate scheme Halfin is accused of is similar to one bakery leader Yusuf Bey IV has been charged with in the purchase of a house at 2514 61st Ave. In that case, Bey IV is suspected of stealing an identity and using a fake driver’s license to secure loans for the purchase of a house in Oakland. Bey IV pleaded not guilty to those charges and to charges of kidnapping and torturing two women in May. Bey IV, Halfin and Bey IV’s half-brother Joshua Bey, 21, are accused of using a fake police cruiser to capture two women they thought had money. Bey IV also has become a key figure in the confession of Devaughndre Broussard, a bakery handyman accused of killing Oakland Post editor Chauncey Bailey. Broussard’s attorney LaRue Grim said Bey IV told his client to take the fall for the slaying in order to save the bakery. 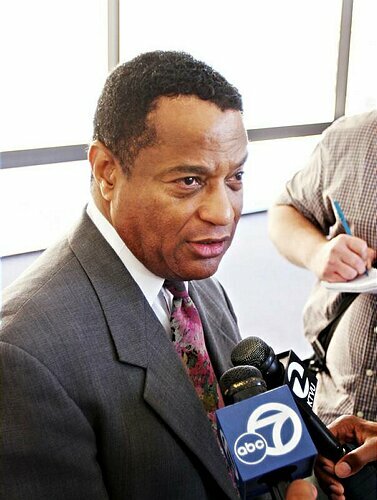 Oakland police placed Bey IV in the same interview room with Broussard before Broussard told police he killed Bailey because of a story the journalist was working on about the bakery’s financial problems and a family feud within the Bey family. All three men are due back in court Sept. 18. Broussard is due back in court Sept. 20.